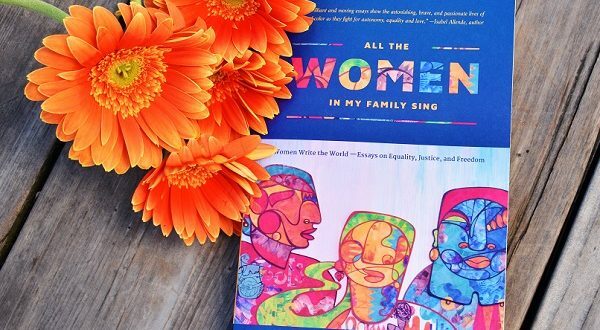 All the Women in My Family Sing: Women Write the World: Essays on Equality, Justice, and Freedom (Nothing But the Truth So Help Me God) is a collection of American culture and diversity in 69 essays written by 69 different women of color. 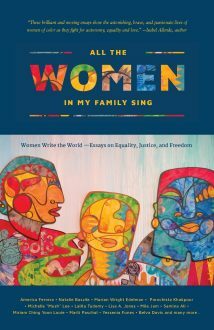 Edited by Deborah Santana All The Women in My Family Sing (ISBN: 9780997296211) is a deeply ecclectic work that provides a strong soundboard for women’s voices. There are short biographies of each of the 69 authors, ranging in ages from 16 to 77, at the end of each essay, which help readers understand the context more and will likely prompt exploration of their other works, causes and interests. Many of these essays contain the time and enough context, but the biographies should have included more information when unknown. Readers can always look up that information before reading to get the proper contextual framework for each piece. Readers can browse by author, topic, title or open this book to a random page beginning a worthwhile journey to draw inspiration, courage, and understanding. Some essays are from first-time writers with obvious writing weaknesses that reflects Santana’s puposeful choices, which might promote these authors and could nurture their future works. All these stories are worth telling and maybe we will see book in the future from Santana based on events related to this book. These chosen works are also very positive and practical. This anthology includes great stories ranging from Iranian American novelist Porochista Khakpour’s “Home” that describes her air travel experiences during the Muslim travel ban to New York Times best-selling historical author Lalita Tademy’s “Willie Dee” that follows her transition to writer from business executive. Familiar reflections and tough memories blend into such a wide range of remediated narratives. In “Forever, for Always, for Luther (Vandross),” Deborah J. McDuffie draws from a well-known subject as she writes “Music is energy, music is vibration, music is God in action” while “Being told I’m not a child of God challenged my mental stability,” is just as effective from Mila Jam in “A Transgender Journey.” Both writings are poignant personal experiences that can inspire, enlighten, and identify with readers on a personal level. Children’s Defense Fund founder/president Marian Wright Edelman offers her take on Harriet Tubman, Dr. Martin Luther King Jr. and more in “The Tireless Indispensable.” Natalie Baszile begins this collection with “Home Going” where she revisits her father’s native Louisiana while doing research for her novel Queen Sugar. Actress America Ferrera’s “We Are America” essay is a powerful touchstone were divided people can try to find some common ground. This essay is taken directly from her speech at the 2017 Women’s March in Washington D.C.
Self titled essays like “Escape from the Cambodian Killing Fields” by Tammy Thea and “Prison Parenting” by Rhonda Turpin can still impact readers in unpredictable ways. No experience is ever a given among several other quality essays that offer different compliments, enhancements, and resulting emotions. Readers should set aside time for reflection after each reading session since each piece offers such a different experience. At the end of the day, we all want to be recognized and loved. Shyla Margaret Machanda’s “The Color of Transparency” ends this anthology perfectly. “I am a human. I am a woman. I am a Canadian. I am equal to all people as they are equal to me. I am not exotic because you are unable to place my background. I am not an other, or an alien. It is not your job to find out where I am from. You should be more concerned with how I treat my family, whether or not I pay my taxes, whether I have ever been in love, if I have experienced great loss or if I am currently in a state of deep sorrow or joy. Published by Nothing But The Truth Publishing, the 366-page All the Women in My Family Sing: Women Write the World: Essays on Equality, Justice, and Freedom (Nothing But the Truth So Help Me God) comes recommended (***1/2 out of four stars). Since it’s already an established list of works, this anthology attains important credibility while the personal stories still evoke genuine emotions.